Bruxism, more commonly referred to as teeth grinding, is a condition that we see frequently at Lake Villa Dental. There are two types of bruxism: awake bruxism and sleep bruxism. Awake bruxism typically involves unconsciously clenching your teeth throughout the day which may be caused by stress, anxiety, anger, or other emotions. It could also be a habit that a person gets into while concentrating, similar to chewing on a pencil. Sleep bruxism happens while you are asleep and could be caused by sleep disorders like sleep apnea or by abnormalities with the jaw or bite pattern. Keep reading to learn more about bruxism and learn how your Lake Villa dentists can help. Some people will only experience bruxism occasionally and this typically does not cause very much harm. However, if the habit continues, the consequences can be severe. While the above are warning signs that you may notice, dentists might notice worn enamel on the tops of your teeth, as well as teeth that are fractured, flattened, or loose. If bruxism goes unaddressed for long enough, your teeth can be worn down to stumps or you might lose them entirely resulting in the need for dental implants. 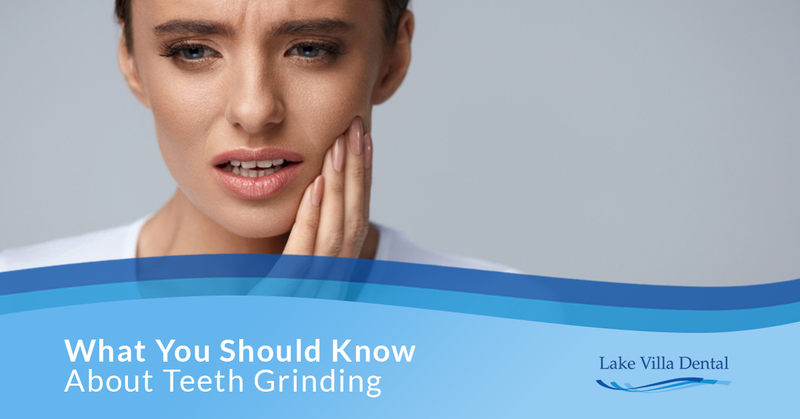 There are several things you can do to limit teeth grinding or to prevent further damage from occurring. Avoiding caffeine and alcohol before bed can help you have a more restful sleep, limiting the amount of muscle activity that occurs while sleeping. Additionally, while awake, be aware of how you are holding your jaw and be sure to keep it relaxed. Some people will only grind their teeth occasionally, and this is usually not harmful. However, if you consistently grind your teeth and experience pain associated with bruxism or have damaged teeth because of it, your dentist can fit you with a custom mouthguard or nightguard. There are three types of mouthguards: pre-made mouthguards, ‘boil and bite’ fitted mouthguards, and custom mouthguards made by your dentist. Your Lake Villa dentist will discuss these options with you and help you choose which type of mouthguard for teeth grinding will be best for you. Do You Grind Your Teeth? Your Lake Villa Dentists Can Help! If you suspect you might grind your teeth, schedule an appointment with the team at Lake Villa Dental. We can examine the health of your teeth and determine if a mouthguard for teeth grinding is the right option for you. Schedule an appointment with your Lake Villa dentist now! ©2017 Lake Villa Dental - All rights reserved.